On this date in 1943, days before their city was liberated, five members of the anti-occupation resistance were shot in Krasnodon in the Donbass. That eastern Ukrainian city* had fallen under German-Italian-Romanan occupation in July 1942. In response, some 100 local teens banded together into an anti-fascist underground — the Molodaya Gvardiya, or Young Guard. (English Wikipedia entry) | Russian) Most of their number would give their lives in resistance. During the few months of occupation, the Young Guards managed an impressive record of sabotage operations and propaganda coups. 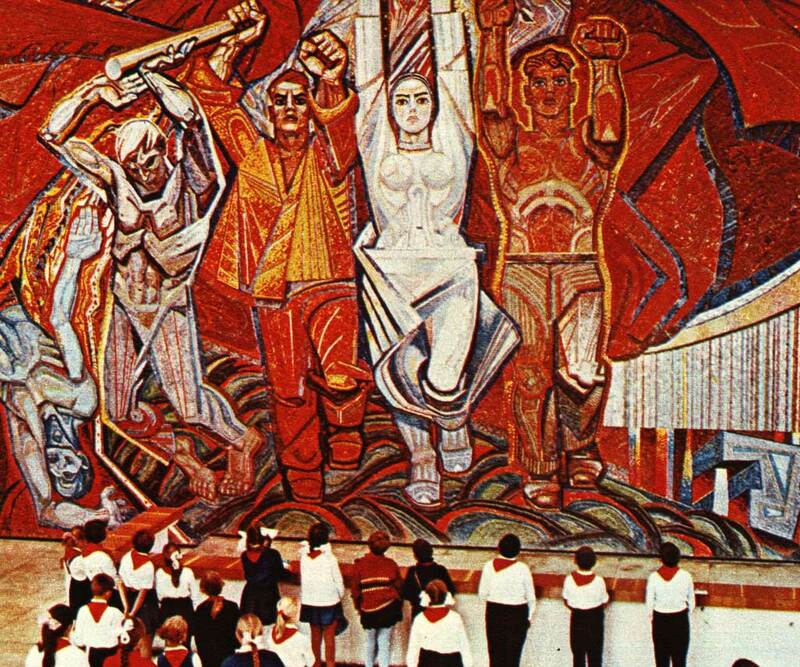 It busted 90 people out of the Germans’ concentration camp, and got the hammer and sickle hung up on government buildings to mark the silver anniversary of Red October. In December, the Young Guards managed to destroy the labor bureau (and its list of intended conscripts) on the eve of a planned deportation, sparing 2,000 people that dreadful fate. The Germans finally got their hooks into the Young Guards and started mass arrests at the start of January. They brought in most of the Young Guards for torture and execution — smashing up the organization in their very last weeks in town. 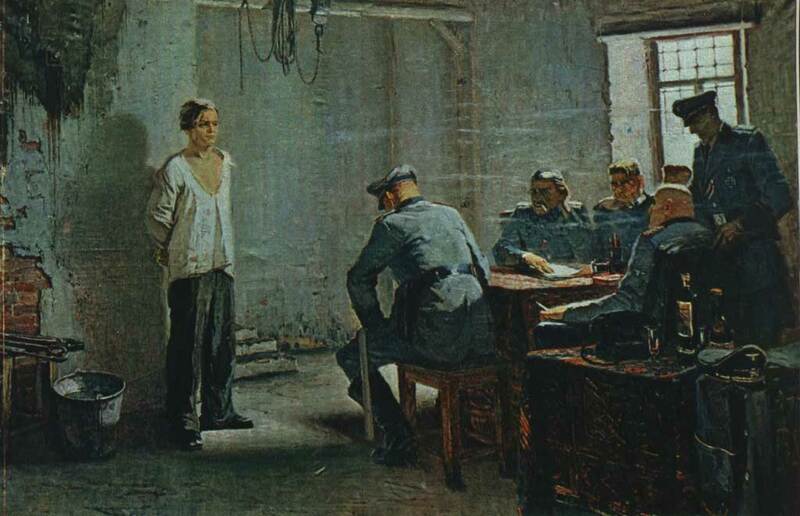 Oleg Koshevoy’s interrogation. Image from MolodGuard.ru’s stupendous images collection. In September 1943, three Soviet citizens were publicly executed in the liberated city on charges of having aided the Germans in suppressing the Young Guards. The Young Guards’ youth and intrepidity made them extremely congenial to the Soviets’ wartime demand for martyrs. At the urging of his Ukrainian deputy Nikita Khrushchev — who himself hailed from the Donbass — Stalin approved a number of the Young Guards (including this date’s Koshevoy and Shevtsova) as Heroes of the Soviet Union. They’ve featured in postage stamps, public artwork, and every manner of patriotic commemoration ever since. They’ve even come in for a bit of post-Soviet “ownership” conflict (over the Guards’ degree of Communist Party affiliation) between Ukraine’s Russian- and Soviet-leaning east and the nationalist-sympathizing west. Today the “Molodaya Gvardiya” brand might be most immediately recognizable as a youth organ of Vladimir Putin’s party — no connection to the young partisans, of course. * Not to be confused with the Russian city of Krasnodar.